The goal here was to find a playable mechanical roulette system, that will let us win 1 unit every time. This is enough to beat roulette. each cycle of 37 spins (or 38 american 00 wheel). 1 unit on the chosen number. the bet goes to 8 units. Why the bet selection ? would run out well before that time. this and what numbers won't. (opinion). far behind) will never be one of these "doomed" numbers. on average as expected or has been showing ahead of expected. Will not be a number that will be the next long-term sleeper. Sounds complicated maybe but it really isn't. spins as they show - this will give us the number to play. The progression is explained above, simple as well. 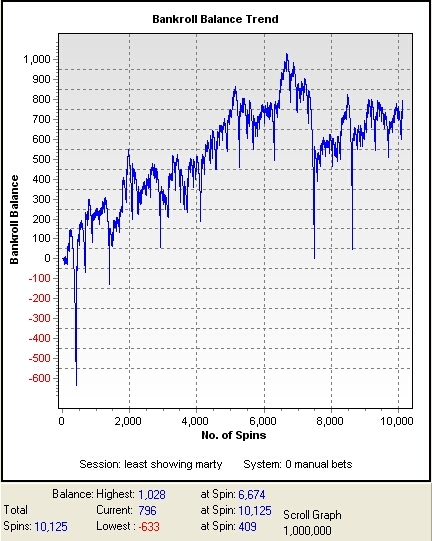 is only to make 1 unit average per casino session. on this same kind of approach to well over 50,000 spins. 2 numbers - the "farthest behind" number and the "farthest back"
number together with a specific progression. somewhat as described above - but without the marty. More numbers than 1 are played as well. number I'm going to play for the next 37 spins. Step 3a ) You have a win (very common) thus a profit. Now look at your notes to find the next number to play. same number flat for the next cycle of 37/38 spins. +796 units over the course of 10,125 spins. 1 unit of profit per every 12.82 spins. visits with 1 unit profit average for each visit. The further you record, the better data you'll have. down to only 1 or 2 and wins are more reliable.